From a vacant plot in a blighted neighborhood spring neatly combed rows of plants put in by the neighbors. They meticulously care for this small piece of land, and among the drab-looking buildings sprouts a patch of green. Cultivating the land may have started as a way to unite a neighborhood, to give pride to place, or it might be the project of a local high school to teach land stewardship. Now a team of researchers led by Arizona State University and Google has assessed the value of urban agriculture and quantified its benefits at a global scale. They report their findings in “A Global Geospatial Ecosystems Services Estimate of Urban Agriculture,” in the current issue of Earth’s Future. The researchers analyzed global population, urban, meteorological, terrain and Food and Agricultural Organization (FAO) data sets in Google Earth Engine to come to their global scale estimates. They then aggregated them by country. Overall, the researchers estimated the annual value of four ecosystem services provided by existing vegetation in urban areas to be on the order of $33 billion. In this scenario, they projected an annual food production of 100 million to 180 million tons, energy savings of 14 billion to 15 billion kilowatt hours (insulation properties provided by soil on roofs), nitrogen sequestration between 100,000 to 170,000 tons and avoided storm runoff of 45 billion to 57 billion cubic meters annually. 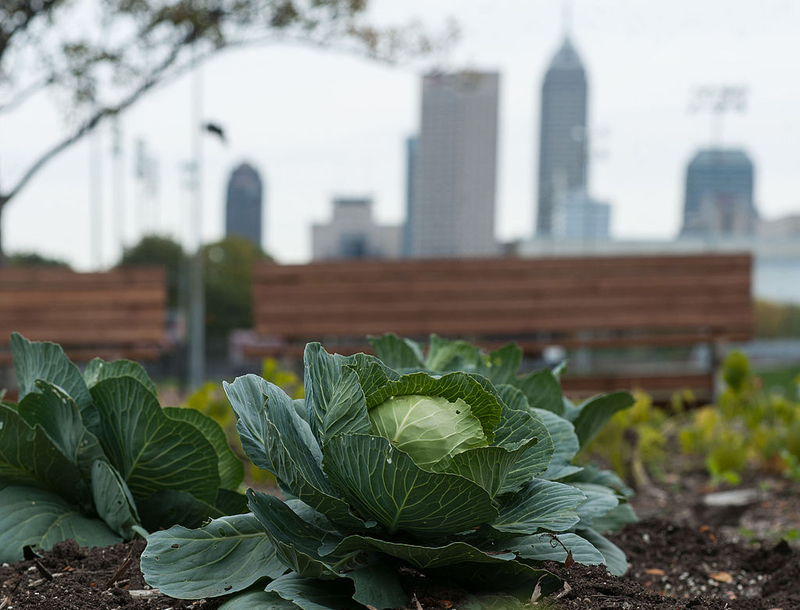 With intense urban agriculture implementation, the researchers estimate the overall annual worth of urban agriculture could be as much as $80 billion to $160 billion. Importantly, urban agriculture could help feed a world that may face future challenges in industrial agriculture as a result of climate change. “We’ve known there are benefits to having these small plots of land in our cities, but we found that the benefits extend well beyond having fresh food in the hands of those who will consume it,” explained lead author Nicholas Clinton of Google. “By integrating across elements that comprise the food-energy-water nexus, our work characterizes the heterogeneous nature of ecosystem services. It is a benchmark global scale assessment,” added Georgescu, who also is a senior scientist in the Julie Ann Wrigley Global Institute of Sustainability at ASU. In addition to Georgescu and Clinton, co-authors of the paper are Albie Miles of the University of Hawaii; Peng Gong of Tsinghua University, Beijing; ASU graduate students Michelle Stuhlmacher, Nazli Uludere and Melissa Wagner; and Chris Herwig of Google. The work, the researchers say, provides more than an accounting of the effect of urban agriculture in one scenario. It can be used as a tool for future assessments of the changing urban agriculture landscape to better understand tradeoffs between urban design strategies. “The value of this approach to the global community — research, governmental organizations, political groups — is that it provides local stakeholders with a quantitative framework that they themselves can use. For example, they can assess local implications of varying urban agriculture deployment scenarios based on current or projected urban extent, current or projected building height and facades, different yields, etc., that are all specific to the location under consideration,” Clinton explained. Looking at the future of urban agriculture, Clinton said countries that have the most incentives to encourage it share two primary characteristics — sufficient urban area, and a national-scale mixture of crops that lends itself to urban cultivation. In addition to the NSF, funding for the project came from the U.S. Department of Agriculture, a National High Technology Grant from China and Google Inc. In 2021, a spacecraft the size of a Cheerios box will carry a small telescope into Earth orbit on an unusual mission. Its task is to monitor the flares and sunspots of small stars to assess how habitable the space environment is for planets orbiting them. The spacecraft, known as the Star-Planet Activity Research CubeSat, or SPARCS for short, is a new NASA-funded space telescope. The mission, including spacecraft design, integration and resulting science, is led by Arizona State University's School of Earth and Space Exploration (SESE). "This is a mission to the borderland of astrophysics and astrobiology," said Evgenya Shkolnik, assistant professor in SESE and principal investigator for the SPARCS mission. "We're going to study the habitability and high-energy environment around stars that we call M dwarfs." She announced the mission Jan. 10, 2018, at the 231st meeting of the American Astronomical Society, in Washington, D.C.
"We're aiming to show that small space telescopes like SPARCS can answer big science questions." The stars that SPARCS will focus on are small, dim, and cool by comparison to the sun. Having less than half the sun's size and temperature, they shine with barely one percent its brightness. The choice of target stars for SPARCS might seem counterintuitive. If astronomers are looking for exoplanets in habitable environments, why bother with stars that are so different from the sun? An answer lies in the numbers. To start with, M dwarfs are exceedingly common. They make up three-quarters of all the stars in our Milky Way galaxy, outnumbering sun-like stars 20 to 1. Astronomers have discovered that essentially every M dwarf star has at least one planet orbiting it, and about one system in four has a rocky planet located in the star's habitable zone. This is the potentially life-friendly region where temperatures are neither too hot nor too cold for life as we know it, and liquid water could exist on the planet's surface. Because M dwarfs are so plentiful, astronomers estimate that our galaxy alone contains roughly 40 billion — that's billion with a B — rocky planets in habitable zones around their stars. This means that most of the habitable-zone planets in our galaxy orbit M dwarfs. In fact, the nearest one, dubbed Proxima b, lies just 4.2 light-years away, which is on our doorstep in astronomical terms. So as astronomers begin to explore the environment of exoplanets that dwell in other stars' habitable zones, M dwarf stars figure large in the search. According to Shkolnik, while M dwarf stars are small and cool, they are more active than the sun, with flares and other outbursts that shoot powerful radiation into space around them. But no one knows exactly how active these small stars are. Over its one-year nominal mission, SPARCS will stare at target stars for weeks at a time in hopes of solving the puzzle. The heart of the SPARCS spacecraft will be a telescope with a diameter of 9 centimeters, or 3.6 inches, plus a camera with two ultraviolet-sensitive detectors to be developed by NASA's Jet Propulsion Laboratory. Both the telescope and camera will be optimized for observations using ultraviolet light, which strongly affects the planet's atmosphere and its potential to harbor life on the surface. "People have been monitoring M dwarfs as best they can in visible light. But the stars' strongest flares occur mainly in the ultraviolet, which Earth's atmosphere mostly blocks," Shkolnik said. Although the orbiting Hubble Space Telescope can view stars at ultraviolet wavelengths unhindered, its overcrowded observing schedule would let it dedicate only the briefest of efforts to M dwarfs. "Hubble provides us with lots of detail on a few stars over a short time. But for understanding their activity we need long looks at many stars instead of snapshots of a few," said Shkolnik. Capturing lengthy observations of M dwarfs will let astronomers study how stellar activity affects planets that orbit the star. "Not only are M dwarfs more active than the sun when they are old, they remain more active for longer," Shkolnik said. "By the time it was 10 million years old, the sun had become much less active and it has been decreasing steadily ever since. But M dwarfs can remain active for 300 to 600 million years, with some of the smallest M stars flaring often essentially forever." SPARCS will follow in the footsteps of other space instruments and probes originating from SESE. Already on its way to asteroid Bennu (arrival August 2018) is the OSIRIS-REx Thermal Emission Spectrometer (OTES). In the pipeline are the Phoenix CubeSat (built by an all-student team to study the local climate effects of cities on Earth), LunaH-Map (to measure lunar hydrogen as a proxy for water), the Europa Thermal Emission Imaging System (to seek temperature anomalies on Jupiter's moon Europa), the Lucy Thermal Emission Spectrometer (to measure surface properties among Jupiter's family of trojan asteroids), and Psyche, a mission to study an asteroid made wholly of nickel and iron. "Building SPARCS at ASU will give students educational and training opportunities to become future engineers, scientists and mission leaders." Like LunaH-Map, SPARCS is a CubeSat built of six cubical units, each about four inches on a side. These are joined to make a spacecraft two units wide by three long in what is termed a 6U spacecraft. Solar power panels extend like wings from one end. "In size and shape, SPARCS most resembles a family-size box of Cheerios," Shkolnik said. The spacecraft will contain three major systems — the telescope, the camera, and the operational and science software. Along with Shkolnik, SESE astronomers Paul Scowen, Daniel Jacobs, and Judd Bowman will oversee the development of the telescope and camera, plus the software and the systems engineering to pull it all together. The telescope uses a mirror system with coatings optimized for ultraviolet light. Together with the camera, the system can measure very small changes in the brightness of M dwarf stars to carry out the primary science of the mission. The instrument will be tested and calibrated at ASU in preparation for flight before being integrated into the rest of the spacecraft. "We'll have limited radio communications with SPARCS, so we plan to do quite a bit of data processing on board using the central computer," said Jacobs. "We'll be writing that software here at ASU, using a prototype of the spacecraft and camera to test our code." After launch, Jacobs said the team will do science operations at ASU, connecting up to SPARCS via a global ground station network. A key part of the mission plan, Shkolnik said, is to involve graduate and undergraduate students in various roles. This will give them with educational and training opportunities to become future engineers, scientists, and mission leaders. "The fast pace for development — from lab to launch might be as short as a couple of years — works well with student timescales," Shkolnik said. "They can work on it, start to finish, in the time they're here at ASU." Joining ASU in the SPARCS mission are scientists from the University of Washington, the University of Arizona, Lowell Observatory, the SouthWest Research Institute, and NASA's Jet Propulsion Laboratory. "The SPARCS mission will show how, with the right technology, small space telescopes can answer big science questions," Shkolnik said. These include, she says, "How likely is it that we humans are alone in the universe? Where should we look for habitable planets? And can we find a new and more fruitful understanding of what makes an exoplanet system habitable?"